A tour de force of literary craft and emotional resonance, Like Normal People charts a family constellation that revolves around an off-kilter center: Lena, who is forty-eight but mentally locked in childhood. Moving deftly between present and past, the novel follows Lena's day-long escape from her residential home with her troubled twelve-year-old niece. While this odd couple takes refuge on a honky-tonk southern California beach, Lena's widowed mother, Ella, goes in search of them. In the process, Ella relives her own life's dreams and disappointments: her marriage to a sweet, loving shoe salesman; her discovery of Lena's handicap and her aching attempts to give her daughter a "normal" childhood. For so long, Lena has been the focus of Ella's world. When Lena at last finds approximate normalcy - by marrying a man much like herself - Ella must contend with letting her daughter go. Covering three entire lifetimes in the course of one day, Like Normal People is tender, often hilarious, and deeply moving. Bender brilliantly enters into the consciousness of three women at very different stages of life, each on a private search for love and acceptance. 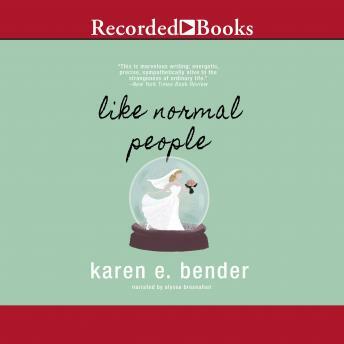 Like Normal People is a novel about desire, about what constitutes normality, and, most poignantly, about the ways in which a family finds its strength in the face of adversity.